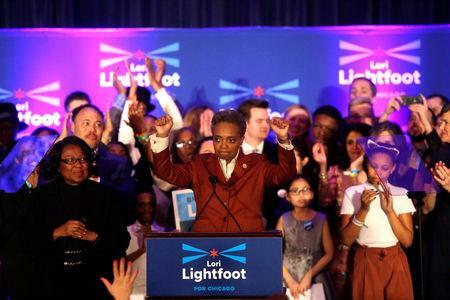 CHICAGO (Reuters) – Lori Lightfoot, a political newcomer, was elected the first black female mayor of Chicago on Tuesday, defeating opponent Toni Preckwinkle by a landslide in a runoff to take over a city struggling with crime and weak finances. A former federal prosecutor, Lightfoot won 74 percent of the vote with nearly all precincts counted compared with 26 percent for Preckwinkle, a long-time local politician, to become Chicago’s 56th mayor. Lightfoot, 56, who will also become the first openly gay mayor of the third-largest U.S. city, appealed to voters who are tired of politics as usual. She has never held political office, while Preckwinkle, 72, was a city councilwoman for almost 20 years before becoming Cook County board president in 2010. “She brings fresh air and is someone I can trust,” Shisha Amabel, a 72-year-old retired social worker who joined supporters at Lightfoot’s celebration at a Michigan Avenue hotel. New Jersey Senator Cory Booker alluded to former U.S. President Barack Obama, once an Illinois senator, in offering his congratulations. 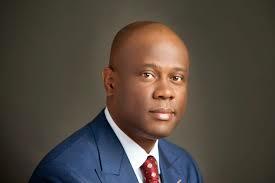 “In a city that serves as the hometown for many Black American politicians who have made history, there is another political first,” Booker said on Twitter. Lightfoot, the former president of independent civilian body the Chicago Police Board, will inherit massive fiscal challenges including a $28 billion unfunded liability for the city’s four retirement systems and escalating annual pension contributions that will top $2 billion in 2023. Lightfoot will take over a city ranked as one of the nation’s most violent. Homicides in Chicago declined by more than a quarter in 2018 from its five-year high of 769 in 2016. But less than one out of five murders were solved in Chicago in the first half of 2018, according to local media. On day one, Lightfoot will also have to find a way to ease tension between the police department and state’s attorney after prosecutors decided to drop charges against actor Jussie Smollett, who was accused of staging a hate crime attack.